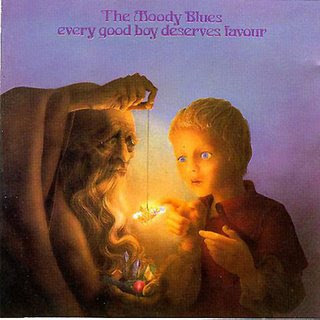 As Graeme Edge has subsequently commented, “We had nerve in those days!” He was speaking of this somewhat nervous album’s opening track “Procession,” which is nothing less than a potted and very selective history of music, all leading up to and culminating in the Moody Blues. Even the Beatles were never that vainglorious. Phil Travers’ cover design was likewise unhelpful; a ghostly parade of musicians from varying eras and ages, again climaxing in the grinning, shaded, bearded visage of Graeme Edge and the rather more reticent Justin Hayward. The record label logo being child to the father of the man on the front cover brings its own suggestive ramifications. Perhaps this presumption was a mask for the group’s increasing insecurity, but as a summation of musical or human history “Procession” hardly measures up to the standard subsequently set by the title track of the Revolutionary Ensemble’s extraordinary 1976 album The People’s Republic, not that the group was aiming for that kind of socio-political statement. In a shade under five minutes, we hear the standard beginning of time whooshes and whirls into which Edge edges with a prototype electronic drumkit – not exactly Tony Oxley’s Ichnos, but nevertheless the first such device to appear in this tale – approximating the sound of rhythm logs. Sundry grunting and sound effects give way to a single note treble clef run on piano – E-G-B-D-F (see what they did there?) – which in turn is followed by some proto-trip hop atmospherics and chain gang chants. For no great or minor reason this converts into a passage for sitar, tabla and flute in the Carry On Up The Khyber fashion before turning into the theme from long-forgotten early seventies kids’ series Mary, Mungo And Midge, followed by a quick “Greensleeves” paraphrase on harpsichord, then cavernous Bach organ, synthesised nineteenth-century romanticist strings, and finally – bypassing jazz, atonal music, country music and the blues – the triumphant emergence of Rock Guitar. All of this would have been marginally more arresting had it not been intermittently interrupted by a stern barbershop quintet intoning key words – “DESOLATION!,” “CREATION!,” “COMMUNICATION!” – at doubtless key points. This evolutionary river sweeps into…a decent power pop rocker. “The Story In Your Eyes” is the record’s best, because clearest, song; despite the dread in Hayward’s voice as he sings “But I’m frightened for your children,” the general mood is upbeat, positive. However, there are also palpable signs of stiffening of creative muscle; everything now seems broadened out, simplified in order to project better across large stadia – the pelting Elton John-anticipating piano, the great waves of mellotron and Moog at regular intervals, still a shadow of early sixties Brumbeat. The Moodies were getting tired out by this stage – the sleevenote to the CD issue chronicles a catalogue of illnesses and minor accidents throughout this period, not to mention the first stirrings of disagreement and discontent among band members – and it shows. “Our Guessing Game” is yet another in the line of melancholy Ray Thomas navel-admiring ballads; though beginning with limpid Eric Carmen piano, Edge’s padding drums swell out the soundscape, and the arrangement rises to become something akin to a more pompous Seekers. “Emily’s Song” is an unremarkable Simon and Garfunkel/CSN-style ballad written for John Lodge’s newborn daughter, and Edge’s “After You Came” makes some effort to rock out; again they are clearly playing to the stadium crowd – the track sounds something like a souped-up Nash-era Hollies, and Hayward’s sense of drama (“Like the raaaaAAAIIIINNN rising from the SEA!”) is unsullied, but the big boogie fadeout is rather misplaced. In spite of these songs’ melodic and structural similarities to parts of Love’s Forever Changes – the elephant in the Moodies’ sitting room? – the overall picture is of a group who don’t really know where, or why, they’re going. On listening to “One More Time To Live,” however, one gets the distinct impression that the group really cannot get out of the sixties. Starting off as a mopey acoustic ballad, the song gradually builds up until it reaches a baffling extended middle section with sundry “-ations” being chanted (“Starvation!,” “Degradation!,” “Humiliation!,” and even unto the first three words we heard in “Procession”); it’s rather like a Surrey cricket club attempting “Ball Of Confusion,” although the framing tune seems equally indebted to David Gates’ “If” and Lennon’s “Dear Prudence.” The curt dismissal of real radicalism (“Tell me, someone, why this talk of revolution?/Tell me, someone, when we’re changing evolution!”) in favour of a mushy, universal misreading of “love” betrays an underlying conservatism (which the following year was to be reinforced by Seventh Sojourn’s disingenuous “Lost In A Lost World”), and much more so than “Revolution” or “Street Fighting Man,” both of which had at least the indecency to be ambiguous in an we’re-on-your-side-really sense. It is difficult to escape the spectre of five rich men lecturing us and haranguing us to mend our ways, open our eyes, and so forth. Then again, Thomas’ “Nice To Be Here,” allegedly inspired by the work of Beatrix Potter, may imply an almost punk-like level of stubborn aesthetic resistance; here are the jaunty flutes and “Cecilia” percussion, there a faint shiver on the word “breeze,” and frogs are playing guitars (Hayward manfully attempting a solo using just one string), owls are blowing oboes, and it is still 1967 – unlike the true, hard-won comfort of Fogerty’s “Lookin’ Out My Back Door,” this is completely dissociated from life and really unforgivably fey; yes, I know, we have another hedgerow and enchanted woodland creatures of Midlands origin coming up in a few entries’ time, but it is the difference between dimly turning away from life and deploying fantasy to scream “life” in the face and provide something better. At least Roger Glover’s The Butterfly Ball had the not inconsiderable power of the late Ronnie James Dio to drag it out of terminal tweeness. “You Can Never Go Home” is sadly nothing to do with the similarly named Shangri-Las song (“I Can Never Go Home Anymore”), but does point further to the picture of a lost group; Hayward does his best ballad singing (“A million ye-hears ago”), “Strawberry Fields” gets suitably referenced, there is another rock out for the would-be anthemic chorus (the “All my life…” section resembles what a defeated England squad might have recorded as a forlorn follow-up to “Back Home”), but the sorrowful downward shrug of “Bu-ut” indicates a sadness and exhaustion which aren’t really being healed by the music; here are the standard Moody tropes – rain, sun, two, one – but there is no sense of revelation or discovery, more a graver sense of well-worn ground being retread to perpetuate a profitable brand. It’s down once more to Mike Pinder to provide the big finish with “My Song,” but this too sounds fatigued, lacking even the atoms of invention present in “The Voyage” two years earlier. An “Angel Of The Morning” string introduction gives way to Pinder and his piano, gloomily musing on love, other worlds and things going on inside his head. His song disappears for a bit, abandoning us to sequences of Disney harp, stuttering drums, drones, abstract whorls of Moog wind, forlorn celeste, a Morricone-esque choral hum, before the band crashes (in their own way) back in and the song resumes. An oboe hoots its farewell, and a synth skyrocket shoots up to who knows where? Where Tarkus sounds like an angry wasp, Favour comes across as a depressed dormouse; the world is still going to pot, and real answers continue to be skilfully avoided. Yet for so many – Thomas’ flute remind us that they could be a Jethro Tull devoid of humour, irony or side (but isn’t that the point of Tull?) – they were enough, perhaps the first custom-built stadium rock band with big songs, or mediocre songs dressed up fancily enough to look and sound big. I think of another entry in this tale, some thirteen years still in the future, where an Irishman will essay his own take on “-ation”s. And of course I’m hammering a peanut with a bulldozer here. Still, they managed one more album – the aforementioned Seventh Sojourn, recorded in uncomfortable conditions but giving them their first US number one – before taking six years’ leave and coming back to discover that “other worlds” had landed and taken over in the meantime. Not that that mattered; they were still capable of topping the American album chart as late as 1981, and people of a certain time continue to flock to see them in concert, reminding themselves of that glimmer – that minute spot of light – which once told them that the world could have been theirs.